Somedays, I'm like Gooseneck. Bulging eyes, heavy headed, in a cute, minty dress. I know I am lucky to have my Goat Monster friend emerging from the purple bushes beside me. Maybe it's too many hours staring at back lit screens, but those dagger eyes are a sign that I, like Gooseneck, could use some SUNSHINE! Some butterflies, flowers. Some fresh air. And let's not forget, what is behind the "Welcome door"! I am speaking metaphorically here, even though there is a "Welcome Door" behind Gooseneck in my little card. Have you been imagining, envisioning or daydreaming of trying something new or something you haven't done in a while? I encourage you to take this moment to get in touch with your wishes, and SPRING FORWARD into taking a step to make that dream a reality! Finish that project! Hang out with your Goat Monster friend! Whatever your dream may be, I wish you the courage to take the steps to make it happen while Spring is here. Change is in the air. So dare to dare. The purple bushes (paper from the inside of my Naked 2 Urban Decay Eye Shadow Pallet) serve as fresh allergy inducing vegetation! Goat Monster is a loyal, quirky friend I hope to know in all Seasons. As for Gooseneck, she is that wide-eyed and weary woman many of us can identify with from time to time. Stampotique's Designer Challenge Blog is here. Gooseneck Rubber Stamp is here. Big Bee Rubber Stamp is here. Medium Bee with Tiny Bee Rubber Stamp is here. Welcome Door Rubber Stamp is here. 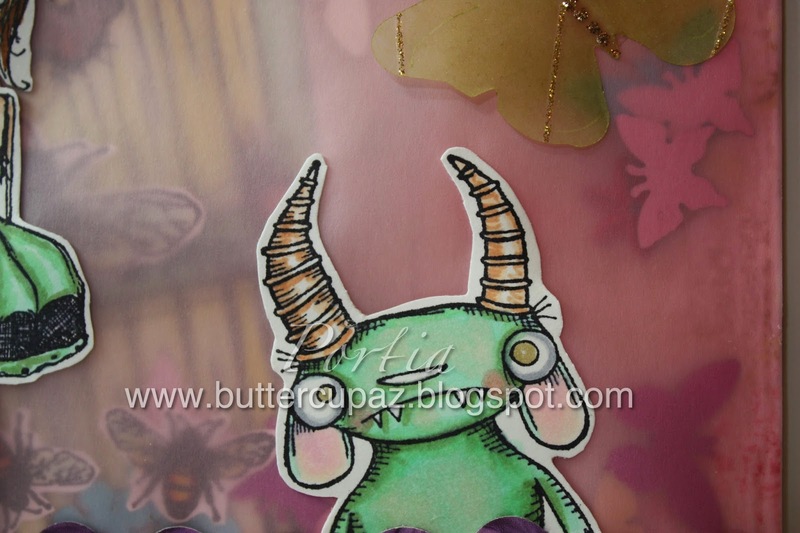 Goat Monster Rubber Stamp is here. Spring Forth with Tiddly Inks!!! move or jump suddenly or rapidly upward or forward. "I sprang out of bed"
"madness and creativity could spring from the same source"
"all art springs from feelings"
the season after winter and before summer, in which vegetation begins to appear, in the northern hemisphere from March to May and in the southern hemisphere from September to November. "in spring the garden is a feast of blossom"
a resilient device, typically a helical metal coil, that can be pressed or pulled but returns to its former shape when released, used chiefly to exert constant tension or absorb movement." Where I live, there is not much differentiation between seasons. Spring to me, happens within! We as humans are constantly evolving, growing, learning and exploring. Spring is 365 days a year, baby!!! 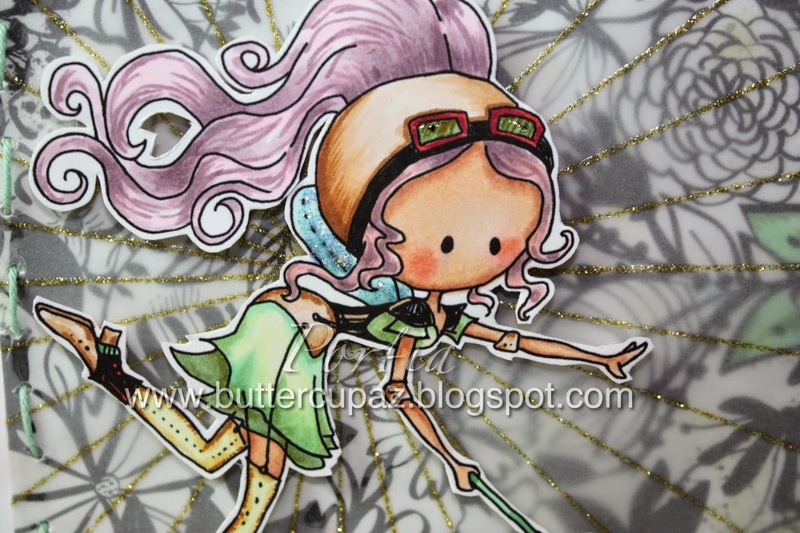 Watch as "Tanker Fairy Flies", a digi by Tiddly Inks, flies and spreads the joy of Spring! To Tanker Fairy, Spring is a rebirth! Time to begin anew, do some self-reflection and adjust accordingly! Wa-hoo! This card is inspired by The Tiddly Ink's Challenge Blog which is to create a Spring Inspired image, using Tiddly Inks stamps, digi or clear! Thank You bunches for stopping by! I wish you the courage to Spring Forth and continue blossoming. Tiddly Ink's Challenge Blog is here! "Tanker Fairy Flies" Digi Image is here! Would you describe yourself as a "Cat Lady" or perhaps a "Cat Gentleman"? Are you a "Kitty Person" or a "Puppy Person"? Whenever I am asked if I am a cat or dog person, I freeze for 2.5 seconds because I consider the question, and come to the conclusion that I LOVE BOTH! 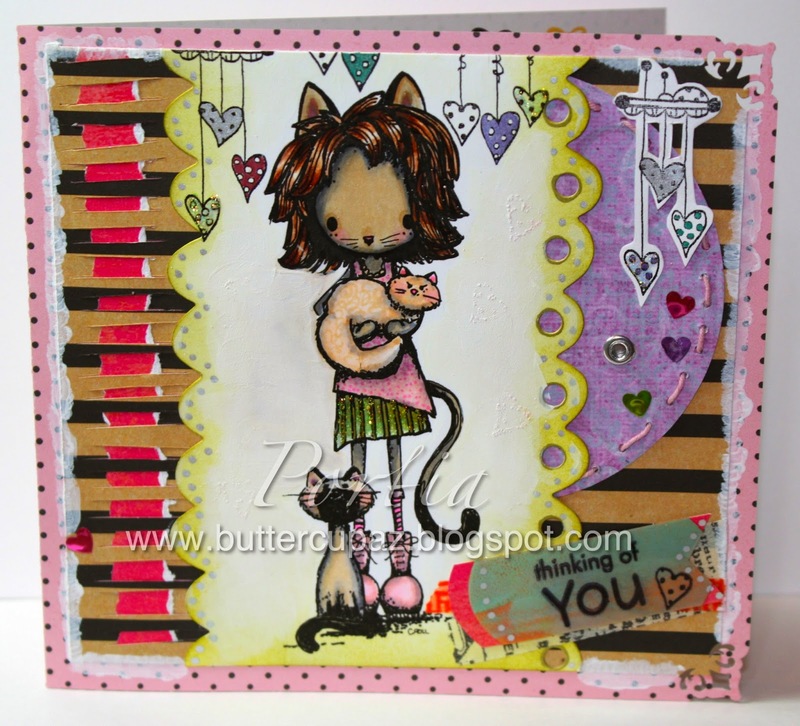 "Cat Girl" by Christy Croll for Tiddly Inks is one of my MOST FAVORITE images! There is a stillness and a sweetness to this digi stamp which I so appreciate. Sometimes, we as humans just need to bond with our furry friends. Be that a coworkers named Johnny, a neighbor named Sam or a kitten named Larry. Bonding with pets, animals, people, is truly one of life's joys. Furry Friends are AWESOME! But, as you can see as depicted in "Cat Girl", one may start to adopt some of the features of one's furry company. Clearly I had a pet donkey in a former life. lol. Pray tell, which animal in past or present existence do you believe you represent (be it physically, mentally, esoterically)? LEAVE A COMMENT I WOULD LOVE TO KNOW!!! I already told you mine. Donkey all the way!!! So why did this Donkey Girl make this Cat Girl card? Because because because, I am submitting my creation into the Tiddly Inks Design Team Challenge! Many moons ago I was lucky enough to score a spot on the Tiddly Ink's Design Team and this is my pitch to join that sweet team again!!! Here's hoping lightning strikes twice!!! Tiddly Inks Images are here! 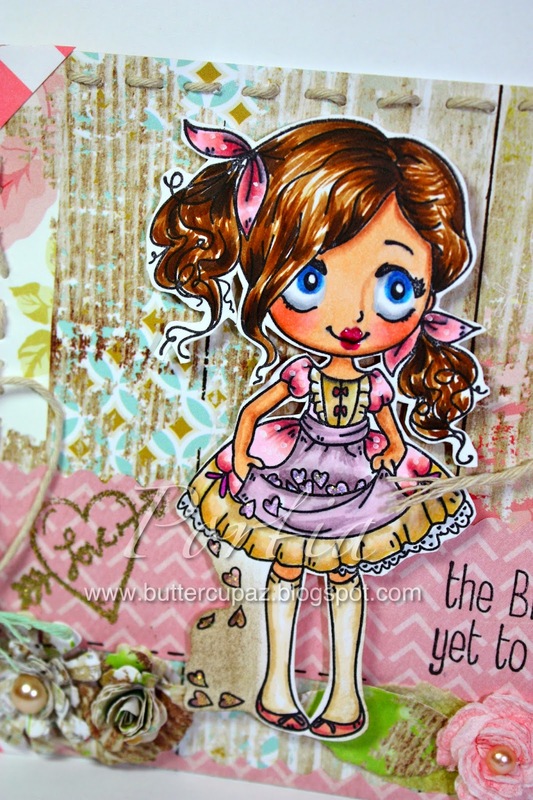 Tiddly Inks Challenge blog is here! A critical part of growth is trying new things and sometimes failing. I have yet to decide if this creation is a FAIL or a SUCCESS, but it was fun nonetheless! Instead of using my go-to black ink, I stamped with clear embossing ink and clear embossing powder. Then, the image was colored with Distress Inks, applied with water and a tiny paint brush. I added my own black pen outline because I did miss having some of that stark contrast between the image and the background. 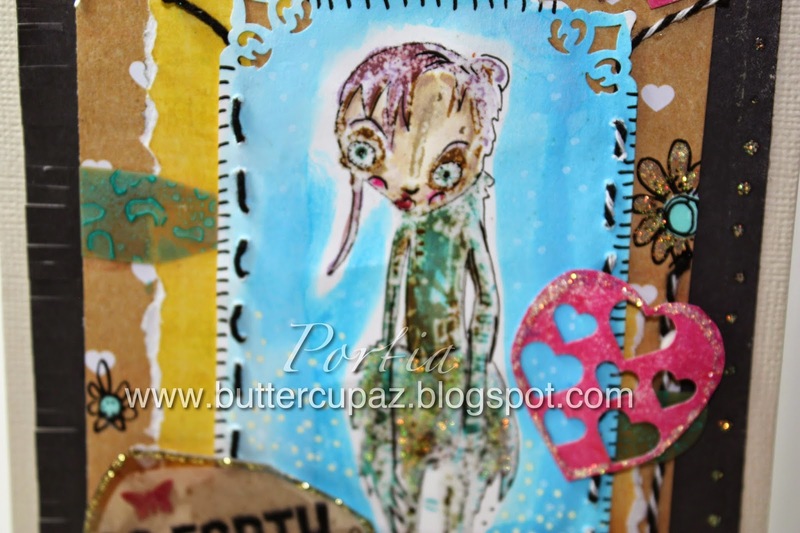 The background is a big, scrappy conglomeration of Mica, scraps of paper, plastic, glitter and doodles. "Mink" Rubber Stamp by Daniel Torrente from here. This creation is inspired by The Stampotique Designer Challenge which is to use STITCHES of some sort on your stamped creation! Stampotique Designer Challenge is here. OH SO GIRLY with TGF!!! She's CUTE, she's CRAFTY, she wears LAYERS and is SCRAPPY! What's her name? She is "Dollie with Hearts" by The Greeting Farm!!! I was so THRILLED to win a gift card from TGF that I just HAD to get this little Dollie! Is it normal to get this excited over card making? I don't know what normal is, but I am addicted to all things crafty! I might also add, I am so thankful to be able to access the internet, to be inspired by all of the craters I mean CRAFTers out there on youtube, in blogs, in stamping challenges. The world is amazing and being able to connect to crafters of similar interests is the bee's knees! 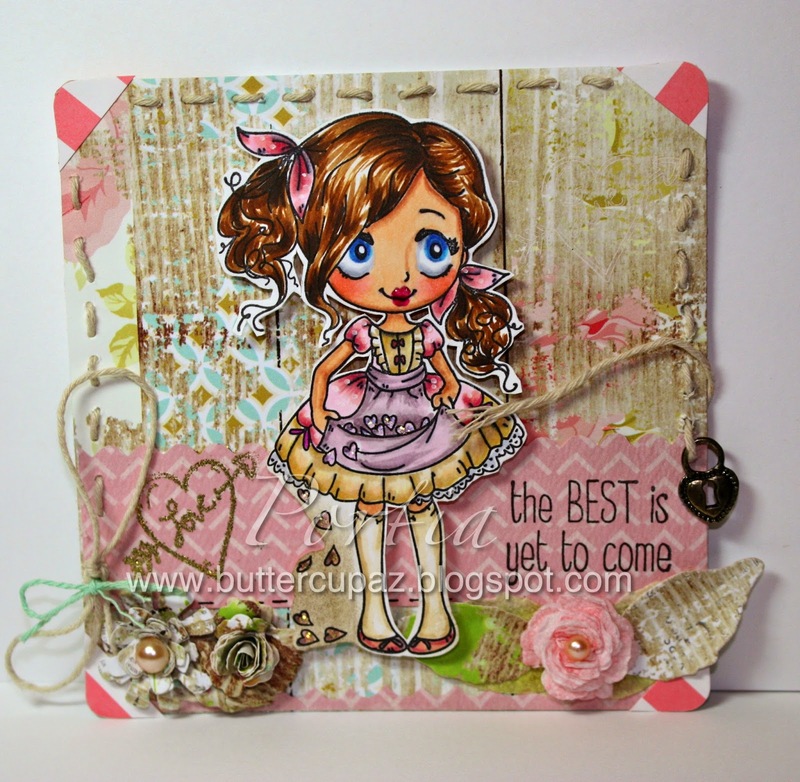 The FFF challenge this week was to create a project which is "OH SO GIRLY"! What is girly? I am sure many of you have heard that girls are "Sugar and spice and everything nice". According to the Urban Dictionary, "Girly" is, and I quote, "An adjective that describes the sort of girl whose favourite colour is pink and isn't afraid to flaunt it through her line of clothing. She is stereotyped with wearing long hair, skirts/dresses and that sorta girly stuff. Erm... as in Reese Witherspoon in Legally Blonde." Are you a Girly Girl? I must say, I am every woman. Dressing down, up, sideways, it's all fun!!! I am currently loving my butterfly kaftan and keeping it really low-key. But if life calls for a dress, I will rock that dress! Will it be as charming as "Dollie"? Now, that's debatable, but still…I urge you all to let your GIRLY Flag Fly High! Why not? PLEASE know your questions and comments are welcomed! If you prefer, you may email me at buttercupblogs at gmail dot com and I will get back to you as soon as possible! Have a wonderful "NOW". I wish you the courage to let your Girly Flag Fly High! And if you prefer feeling otherwise, fly that flag high, too! OH SO GIRLY Challenge here! 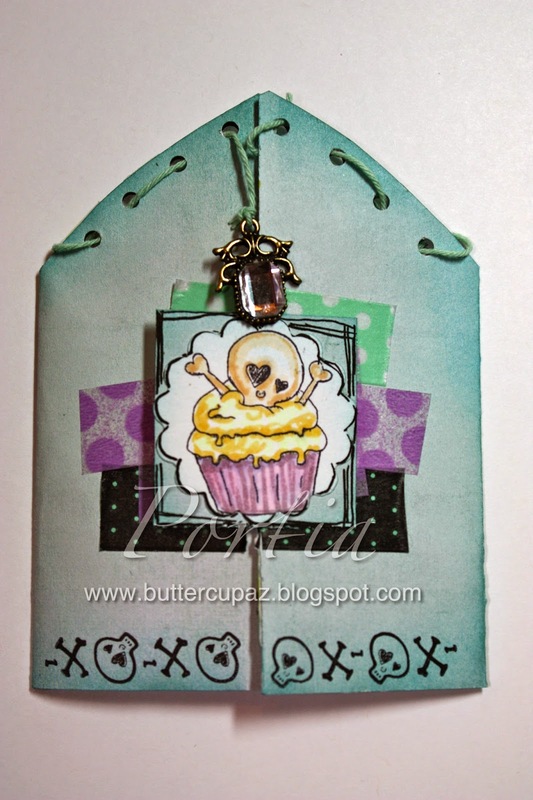 "Dollie with Hearts" Rubber stamp here! My name is Buttercup and I have a sweet tooth! Or, sweet teeth! That's more like it. Almost all of my teeth are cravers of that something sweet! I plan on eating celery and peanut butter, but somehow, mini milk chocolate cadbury eggs find their way into my face. Who knows how that happens? It must be science or magic or something like that. haha. I'm blaming it on the Easter Bunny! But hey, maybe not every single day, but from time to time, life calls for a cupcake the size of one's head, don't you agree? 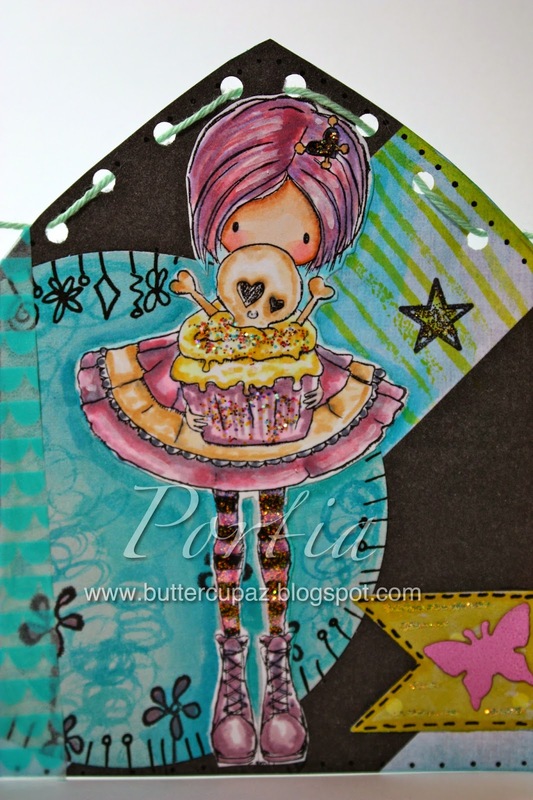 :) I must say, Christy Croll at Tiddly Inks knows how to capture this exact look in her cling stamp set entitled "Sweet Tooth"! Sweet Tooth rocks the striped tights which I adore, wears a fabulous dress and carries the heftiest cupcake I have ever seen!!! Talk about a Lucky Girl!!! *Distress Inks mixed with water and applied with a paint brush were also used on Sweet Tooth. I hope we all get to indulge in something sweet from time to time! Enjoy your day, Be Well, and THANK YOU so much for stopping by!!! 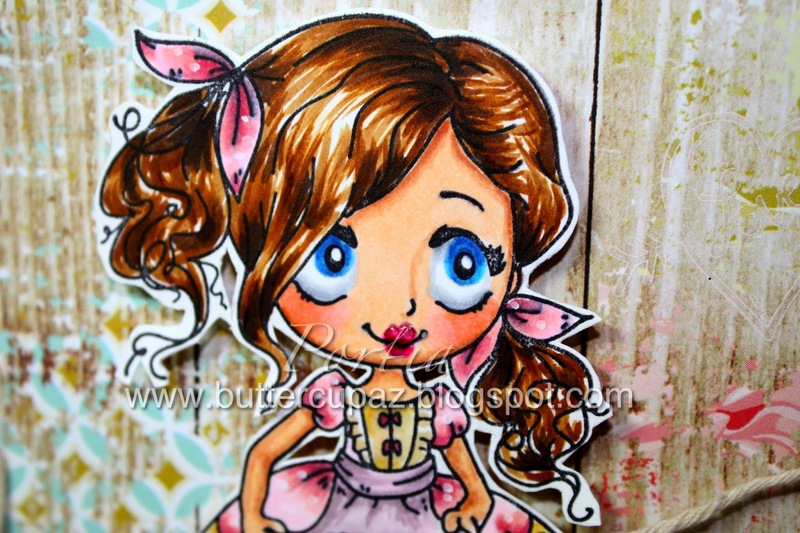 "Sweet Tooth" Clear Cling Stamp by Tiddly Inks found here! "Daisy, Daisy" Rubber Stamp by Jo Capper-Sandon found here! Templates for Arches by Roni Johnson are here. 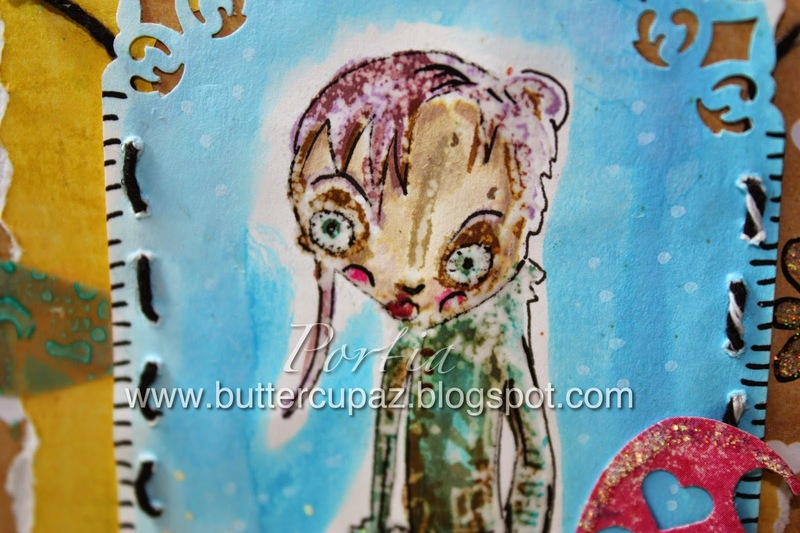 Stampotique Designer Challenge Blog is here. 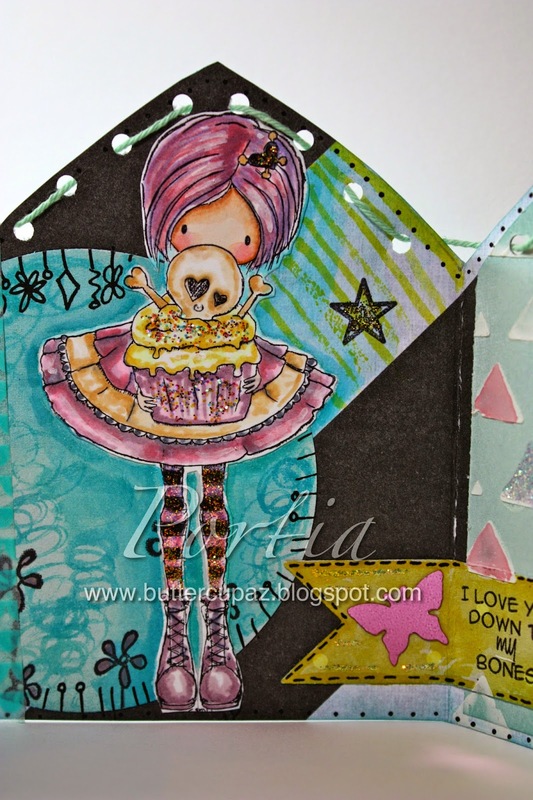 Tiddly Ink's Designer Challenge Blog is aqui!!! This card is to be entered in the Unusually Shaped Stampotique Design Challenge & into the Anything Goes Challenge Blog at Tiddly Inks! Yay! Here is a card inspired by The Greeting Farm's Challenge which is to create something Easter themed! I chose to go the route of Easter Colors! Robin's Egg Blue, Baby pink, all of those pastel colors really say "Easter" to me! Thank You ever so much for stopping by!!! Much Love & Hoppy Easter to you and yours!!! Details for the Farm Fresh Friday "Easter Challenge" may be found HERE!